The Story: French Polynesia offers a variety of underwater photography opportunities but the Sandbar up north of Moorea is probably one of the most accessible ones. It has become a popular tourist site, including for underwater photographers. There, anyone can enjoy some quality time with the sting rays and blacktip sharks and get to know more about inhabitants of the lagoon. The site topography makes it usually a perfect place to capture split shots. One can capture both the dramatic green island in the background as well as the amazing aqua blue and marine life the lagoon offers. The nice, flat sea condition on that particular day made it a very good opportunity to center on the subject only by using the water surface and the bright sandy bottom as support for this pink whipray’s reflection and shadow. 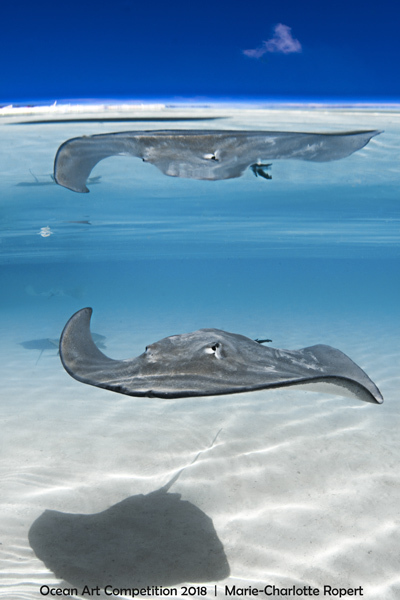 This picture offers to the viewer three different versions of this ray. The subject is always treated in a subjective way, dependent to the photographer’s eye and interpretation, in his choice of composition, lighting, and capturing a scene. The reality is multi-faced, we very often grab only a portion of it.